Relatively compact and lightweight, this new zoom is easy to live with and a stellar performer. Even so, autofocus, stabilisation and outright image quality are no better than from Tamron’s similarly priced 70-200mm f/2.8 G2. 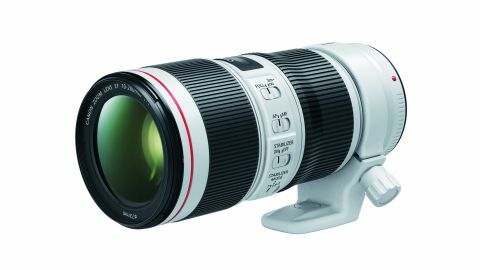 New versions of both of Canon’s EF 70-200mm stabilized telephoto zooms are now available. The Mk III edition of the f/2.8 is only a minor refresh, with a high-tech coating added to one of the internal elements, fluorine coatings on the front and rear elements, and a new paint job that’s a slightly paler shade of grey. The new Mark II edition of f/4 lens is much more interesting to all Canon goers, having undergone a complete makeover. Naturally, the f/4 rating of this lens is a full f/stop slower than that of its f/2.8 sibling but the upside is that it’s significantly smaller and barely more than half the weight, at 780g compared with 1480g. Indeed, a tripod mounting ring is only supplied as an optional extra. Even so, there’s nothing ‘lightweight’ about the quality of construction, which feels very robust and features extensive weather-seals along with keep-clean fluorine coatings on the front and rear elements. The optical path of the new Canon EF 70-200mm f/4L Mk II has now been completely redesigned in the new lens, to improve image quality and reduce the minimum focus distance from 1.2m to 1.0m. A top-quality fluorite glass element teams up with two UD (Ultra-low Dispersion) elements, aiming of boost sharpness and contrast, while still reducing colour fringing. As with the previous edition, the zoom and focus mechanisms are fully internal, so the physical length of the lens remains fixed throughout the entire zoom and focus ranges. Naturally, the ‘constant-aperture’ design means that the widest aperture of f/4 remains available at any zoom setting. Autofocus is still based on a ring-type ultrasonic system but it’s revamped and gains a new central processor unit, resulting in greater speed and accuracy. A focus distance scale is still positioned between the zoom and focus rings, and an autofocus limiter switch enables the short range below three metres to be locked out. There’s big news in terms of image stabilization as well. A completely new system boasts exceptional 5-stop performance, representing a major update of the 3-stop stabilizer in the previous lens. It also outperforms the 3.5-stop stabilizer in the new 70-200mm f/2.8 Mk III lens. The number of switchable IS modes also rises from two to three. Static and panning modes are supplemented by a new mode which only applies stabilization during actual exposures. This makes it easier to track moving objects in the viewfinder, especially if their motion is erratic. • The new edition has a larger 72mm instead of 67mm filter thread. • The large focus ring near the front of the lens operates with smooth precision. • Focus switches include AF/MF and a 3m-infinity range limiter. • Stabilization switches include on/off and three selectable modes. • The weather-sealed construction includes fluorine coatings on the front and rear elements. • The physical length remains fixed at all zoom and focus settings. • An optional A II (W II) tripod mounting ring is available. The new autofocus system is better able to track action when using the camera’s AI-Servo mode. IS mode 3 enables tracking of moving objects in the viewfinder, and comes with auto panning detection. The speed and effectiveness of the new autofocus and stabilization systems live up to Canon’s claims and are every bit as impressive as advertised. Sharpness and contrast are epic, even when shooting wide-open at f/4, and remains utterly sensational throughout the entire zoom range. The lens also performs flawlessly in terms of minimizing colour fringing and flare, and delivers beautiful bokeh, especially toward the longer end of this lenses impressive zoom range. Even when shooting wide-open at f/4, sharpness remains fabulous throughout the entire zoom range. Colour fringing is very negligible at all combinations of focal length and aperture settings.